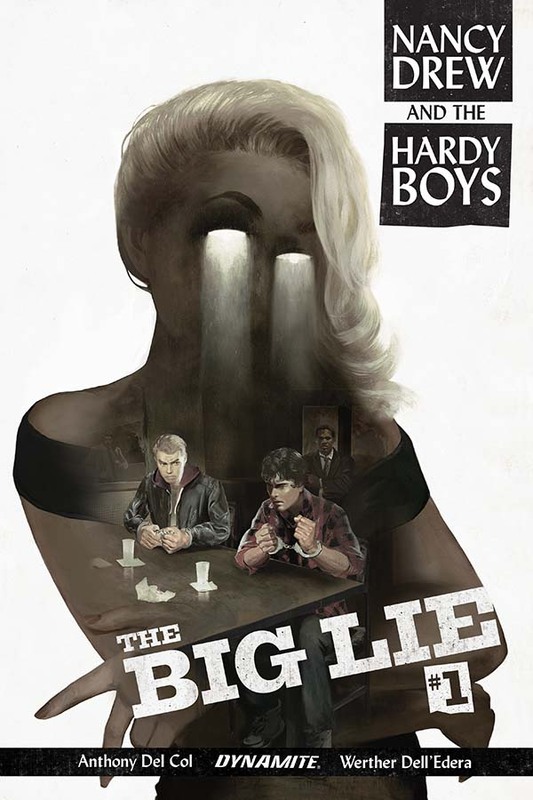 The Fellowship was fortunate enough to obtain a copy of NANCY DREW AND THE HARDY BOYS: THE BIG LIE #1 from Dynamite Entertainment. Anthony Del Col writes, Werther Dell’Edera draws, Stefano Simeone colors, and Simon Bowland letters. Frank and Joe are in serious trouble this time. Dad has been disgraced and thrown off the force. So he puts his own gun in his mouth and pulls the trigger, or so it seems. The boys were out crashing a party at the time, but there’s an hour where no one can remember seeing them. Now they’re prime suspects for the murder of their beloved father. And only one person can help them get out of this one. This is a modernized version of the beloved characters in more than one sense of the word. The setting is now, with the boys being a bit older and using smartphones, and Mom owning an online business. And it’s a darker take on the traditional middle-grade sleuths (as you may have noticed above). Both the story and the art have an almost crime noir feel to them, and in all the right ways. There are a ton of great crime comics happening right now, and this one has the potential to add to that count. And it’s also interesting to see these well-loved characters get a bit of a reboot, if you’ll forgive the term. Definitely worth checking out. NANCY DREW AND THE HARDY BOYS: THE BIG LIE #1 is available now from your local comic shop, or online at dynamite.com.